Over the last couple of weeks big announcements from Apple, IBM and Microsoft have set the stage for what is likely to be Microsoft’s last stand to maintain any sense of personal technology leadership. To many consumers the IBM and Apple partnership probably sounded semi-interesting. An app for airplane fuel management by commercial pilots is not something most people want. But what this announcement really amounted to was a full assault on regaining dominance in the channel of Value Added Resellers (VARs) and Value Added Dealers (VADs) that still sell computer “solutions” to thousands of businesses. Which is the last remaining historical Microsoft stronghold. Think about all those businesses that use personal technology tools for things like retail point of purchase, inventory control, loan analysis in small banks, restaurant management, customer data collection, fluid control tracking, hotel check-in, truck routing and management, sales force management, production line control, project management — there is a never-ending list of business-to-business applications which drive the purchase of literally millions of devices and applications. Used by companies as small as a mom-and-pop store to as large as WalMart and JPMorganChase. And these solutions are bundled, sold, delivered and serviced by what is collectively called “the channel” for personal technology. This “channel” emerged after Apple introduced the Apple II running VisiCalc, and businesses wanted hundreds of these machines. Later, bundling educational software with the Apple II created a near-monopoly for Apple channel partners who bundled solutions for school systems. But, as the PC emerged this channel shifted. IBM pioneered the Microsoft-based PC, but IBM had long used a direct sales force. So its foray into personal computing did a very poor job of building a powerful sales channel. Even though the IBM PC was Time magazine’s “Man of the Year” in 1982, IBM lost its premier position largely because Microsoft took advantage of the channel opportunity to move well beyond IBM as a supplier. Microsoft focused on building a very large network of developers creating an enormous variety of business-to-business applications on the Windows+Intel (Wintel) platform. Microsoft created training programs for developers to use its operating system and tools, while simultaneously cultivating manufacturers (such as Dell and Compaq) to build low cost machines to run the software. “Solution selling” was where VARs bundled what small businesses – and even many large businesses – needed by bringing together developer applications with manufacturer hardware. It only took a few years for Microsoft to overtake Apple and IBM by dominating and growing the VAR channel. Apple did a poor job of creating a powerful developer network, preferring to develop everything users should want itself, so quickly it lacked a sufficient application base. IBM constantly tried to maintain its direct sales model (and upsell clients from PCs to more expensive hardware) rather than support the channel for developing applications or selling solutions based on PCs. But, over the last several years Microsoft played “bet the company” on its launch of Windows 8. As mobile grew in hardware sales exponentially, and PC sales flattened (then declined,) Microsoft was tepid regarding any mobile offering. Under former CEO Steve Ballmer, Microsoft preferred creating an “all-in-one” solution via Win8 that it hoped would keep PC sales moving forward while slowly allowing its legions of Microsoft developers to build Win8 apps for mobile Surface devices — and what it further hoped would be other manufacturer’s tablets and phones running Win8. This flopped. Horribly. Apple already had the “installed base” of users and mobile developers, working diligently to create new apps which could be released via its iTunes distribution platform. As a competitive offering, Google had several years previously launched the Android operating system, and companies such as HTC and Samsung had already begun building devices. Developers who wanted to move beyond Apple were already committed to Android. Microsoft was simply far too late to market with a Win8 product which gave developers and manufacturers little reason to invest. Now Microsoft is in a very weak position. Despite much fanfare at launch, Microsoft was forced to take a nearly $1B write-off on its unsellable Surface devices. In an effort to gain a position in mobile, Microsoft previously bought phone maker Nokia, but it was simply far too late and without a good plan for how to change the Apple juggernaut. Apple is now the dominant player in mobile, with the most users, developers and the most apps. Apple has upended the former Microsoft channel leadership position, as solution sellers are now offering Apple solutions to their mobile-hungry business customers. The merger with IBM brings even greater skill, and huge resources, to augmenting the base of business apps running on iOS and its devices (presently and in the future.) It provides encouragement to the VARs that a future stream of great products will be coming for them to sell to small, medium and even large businesses. Caught in a situation of diminishing resources, after betting the company’s future on Windows 8 development and launch, and then seeing PC sales falter, Microsoft has now been forced to announce it is laying off 18,000 employees. Representing 14% of total staff, this is Microsoft’s largest reduction ever. Costs for the downsizing will be a massive loss of $1.1-$1.6B – just one year (almost to the day) after the huge Surface write-off. Recognizing its extraordinarily weak market position, and that it’s acquisition of Nokia did little to build strength with developers while putting it at odds with manufacturers of other mobile devices, the company is taking some 12,000 jobs out of its Nokia division – ostensibly the acquisition made at a cost of $7.2B to blunt iPhone sales. Every other division is also suffering headcount reductions as Microsoft is forced to “circle the wagons” in an effort to find some way to “hold its ground” with historical business customers. Today Apple is very strong in the developer community, already has a distribution capability with iTunes to which it is adding mobile payments, and is building a strong channel of VARs seeking mobile solutions. The IBM partnership strengthens this position, adds to Apple’s iOS developers, guarantees a string of new solutions for business customers and positions iOS as the platform of choice for VARs and VADs who will use iBeacon and other devices to help businesses become more capable by utilizing mobile/cloud technology. 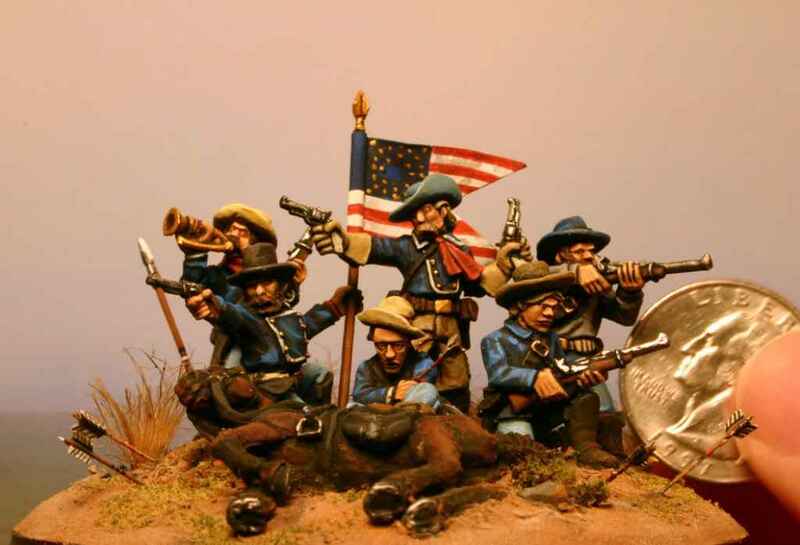 Meanwhile, Microsoft is looking like the 7th Cavalry at the Little Bighorn. Microsoft is surrounded by competitors augmenting iOS and Android (and serious cloud service suppliers like Amazon,) resources are depleting as sales of “core” products stagnate and decline and write-offs mount, and watching as its “supply line” developer channel abandons Windows 8 for the competitive alternatives. CEO Nadella keeps saying that that cloud solutions are Microsoft’s future, but how it will effectively compete at this late date is as unclear as the email announcement on layoffs Nokia’s head Stephen Elop sent to employees. Keeping its channel, long the source of market success for Microsoft, from leaving is Microsoft’s last stand. Unfortunately, Nadella’s challenge puts him in a position that looks a lot like General Custer. The fact that nobody has commented in a month shows how irrelevant Microsoft has become.